Watch me build a new battery / inverter box! I thought it would be fun to have you tag along as I put together my fourth battery / inverter system. My current battery rigs work incredibly well … But are too heavy to get in and out of my truck with two people. I’m hoping that a smaller, modular approach will work. The idea of having a box of batteries that could be used by itself for smaller events … But could also be plugged into a larger system for larger events is very intriguing. I had an old amp rack sitting around that I decided to try out as a battery system. It was a well made case that I had the good luck of not being able to sell on e-bay … And with this year’s Dance for World Community adding another stage to power I decided to give it a try. The case turned out to be an almost perfect fit for four group 31 AGM batteries … A total of about 5 kWh of power if I’m doing the math correctly … I only plan on using about half of that in an attempt to keep the batteries working in top shape for as long as possible. The case was made of 1/2″ luan plywood with some sort of plastic laminate covering, all held together with very heavy duty aluminum extrusion … It was built like a tank! My biggest question … Would the case be able to handle all that weight? 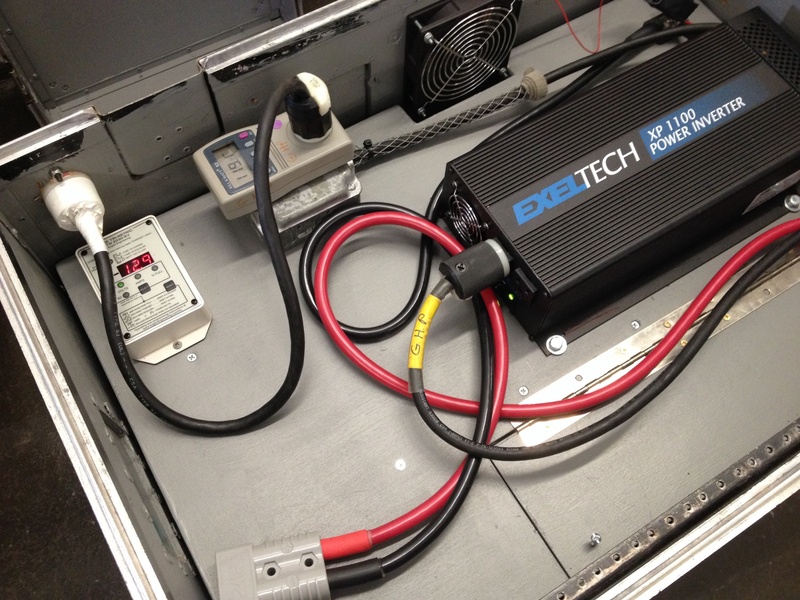 The case did make it a lot easier to wire up the batteries and inverter. The removeable front and rear covers were now going to be the top and bottom, with the main body of the rack becoming the walls of the battery pack. The former rear cover had a nice set of casters mounted on a Baltic birch caster plate … And with the addition of a 3/4″ birch “sub floor”, a layer of KYDEX and another 3/4″ “collar” around the batteries it looked like a good place to start. The next step was to figure out how best to wire the batteries to the inverter. A circuit breaker and fuse are added to keep things safe and a metering system is added to keep an eye on how the batteries are doing. 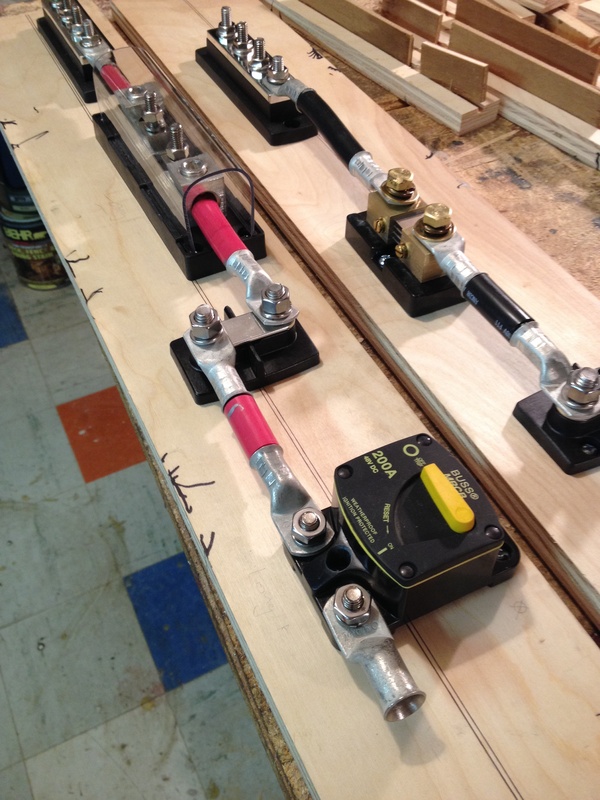 Here I have the two panels I will be using with the buss bars, fuse holder, shunt and circuit breaker mounted on them. Adhesive backed shrink tubing will be added over the crimped on lugs for safety … and to help protect the wire from corrosion. I am using 00 marine grade wire for the interconnecting all the parts and I will be using #2 marine grade wire to connect the 12 volt batteries to the bus bars. It is very important to use the right size wire when working with low voltage DC. The general rule of thumb is to use the largest, shortest wire you can … Otherwise the resistance in the wire will rob you of too much power. I am already thinking of swapping out the #2 cable for #1 … We’ll see! Eventually I will be adding a 350 amp ANDERSON SB connector to the pack (to connect multiple packs together) and have included an “extra” set of buss bars to make it easier to do when the time comes. 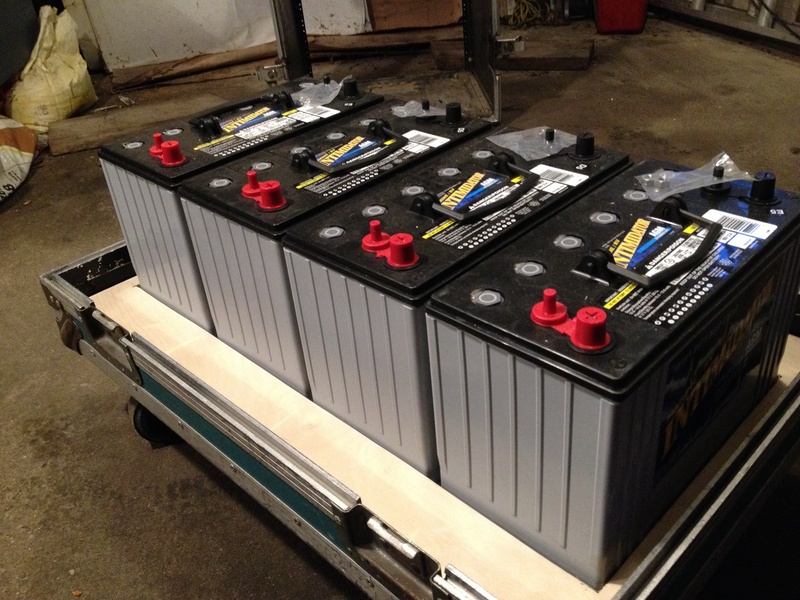 The AGM batteries I am using are supposed to be safe to mount in any position … And I suspect someday someone will tip this case on end to get it off of it’s wheels. I’m curious to see how the spacers hold up under that! I’ve added spacers between the batteries to hopefully keep everything in place should someone ever tries to test the “mount in any position” feature of the AGM batteries! A top “deck” will be mounted on the two power panels for the inverter, battery meter and the ANDERSON SB connectors. A little paint and it’s time for the “final” assembly. I like the modular approach of this system a lot … Making changes as I learn will be a lot easier … In theory! Having this kind of access to all of the connectors was wonderful … You should have seen (heard?) me trying to wire my previous rigs! Almost done … Just need to add the cover and a fan! Shrink tubing added … Circuit breaker and fuses installed … Notice the “trap door” for getting at them … as well as the 175 amp ANDERSON SB connector for plugging into my chargers. With the cover closed up and the fan on the system has been working wonderfully. The next step will be to add the 350 amp connector and assemble a larger inverter / power distribution system. A great project for this winter … Will keep you posted! Ready to go to work! Trimetric 2035 battery meter on the top left, “Kill-A-Watt meter to it’s right and 1,100 watt sine wave inverter and the connector for plugging into my 60 amp solar charge controller below. 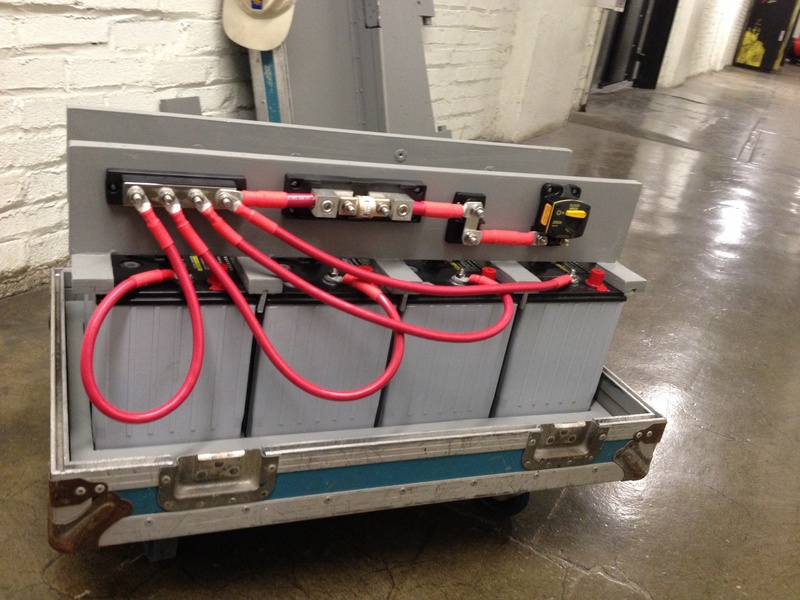 This entry was posted in Outdoor concerts, Parades, Solar power and tagged 12 volt batteries, generators, inverters on August 30, 2015 by zekibeejr. When in doubt … “Google” it! I obviously needed to learn more about things … But how? When in doubt … “Google it”! Hmmmm …. Well … It was worth a try! Getting around on the internet and finding what I was looking for has been a hit or miss proposition for me. … But I digress …. My first attempts at learning about solar power and batteries on the web did not get me very far. However … The folks at Boats and Motors sold me a wonderful book about how an electrical system works on a small boat! Originally written in 1985 and revised in 2003 … It turned out to be a great place to start. The boating world is a really good place to find both hardware and information … It is one of those places where being a little wrong can get you into a lot of trouble. The kind of reliability needed in the boating world is what I wanted / needed for this project. In the entertainment world … failure is not an option! The help I received from Boats and Motors and West Marine was wonderful … they were very happy to share what they knew and if they did not know, would try to find out … And if they were not able to come up with an answer, would apologize for not being able to help! I really like these folks! So lots of questions and a book to read for when things with the “day job” slowed down. I had a busy fall into New Years season ahead of me and nine months until my next booked solar powered gig … So I “moth balled” everything … With a somewhat regular schedule of “top off” recharging to keep the batteries from an early death (I did get far enough into the 12 Volt Bible to learn that much). Made it through the year … With what had become a wonderful tradition of ending the old year mixing the Concert for Peace at St. John the Divine in New York … And the quiet drive back the next day. If you ever get the chance to … Go! … It is an amazing event! 2012 had been a good year … Some amazing shows … It was great to be involved with the Urban Nutcracker again … and everything about the solar project had been a lot of fun … My dad and I working, almost non stop to be ready for that first solar powered Elma Lewis Playhouse in the Park “gig” … a 2:00 in the morning close encounter with a skunk kept things interesting! I was truly amazed at what the batteries were able to do. At a street fair in Andover I “caught” one of the crew from the main stage down on his hands and knees looking to see if I had a power cord coming up from the manhole cover I had “parked” one of the battery boxes on top of. Apparently I was not the only one being amazed! 11 events running over 42 hours … without running out of power … I was able to record 19.03 kWh of power used … It took a while to realize this was going to work and I should be taking notes … I missed three of the early shows. Photos would have been nice too! In any case … January was looking promising for figuring things out … A couple of quiet weeks … and the flu. 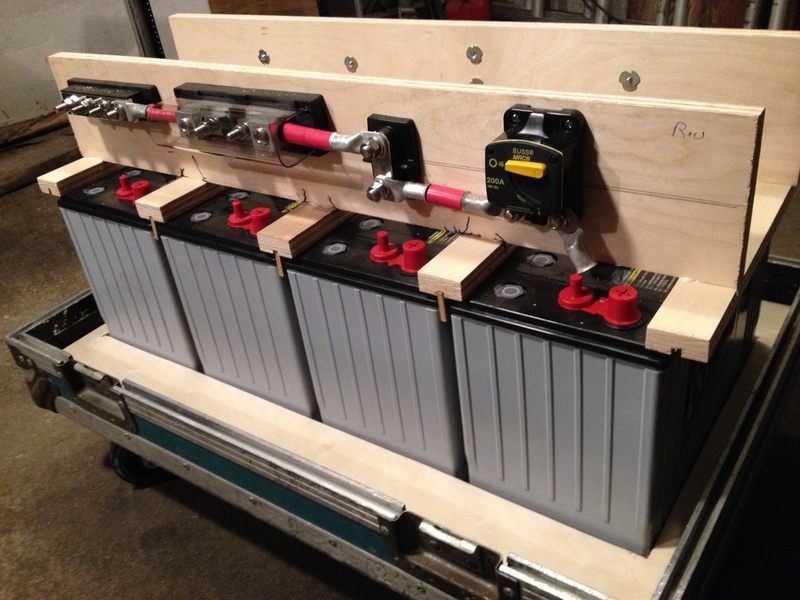 This entry was posted in Classical music, Outdoor concerts, Solar power, sound system, Uncategorized and tagged 12 volt batteries, Elma Lewis Playhouse, Portable, power, solar on August 22, 2014 by zekibeejr. 2012 Elma Lewis Playhouse in the Park. It had been a bit of a rush to put the new battery bank and inverter system together. With no time to add solar panels for the much larger system, a plan “B” was going to be needed for recharging the new battery bank. Christine from the Franklin Park Coalition came to the rescue! She made a couple of phone calls and a place was found in the Franklin Park Zoo maintenance yard where the battery boxes could be parked between shows to plug into the grid and recharge each week. Not exactly solar powered … But we would not be needing a generator for the series! The morning of July 10, 2012 started off nicely … sunny and warm. A local community group had agreed to provide the sound system for the morning events and everything was sounding great … But when a third self powered speaker for the stage was added, it buzzed … a lot. The poor stage monitor was not even close to happy. After checking the cables to see if a bad connection was causing the noise, running a power cord to the new battery / inverter system to see if that might help … and watching the clock tick as show time got closer and closer … I pulled an amp and speaker from my truck, set them up and turned them on … The silence was golden! Something about that self powered speaker did not like the battery / inverter power. The rest of the morning show went smoothly, with the smaller solar powered system running for a little over two hours, using .23 kWh of power (according to the “kill a watt” meter), with the inverter’s battery meter still showing “full”! And … aside from the buzz … a success! The evening show, with one of my sound systems, started out fine. I had hired Clara Rhee to mix the show so I could keep an eye on the battery systems for their “shake down cruise”. No hums or buzzes showed up in the sound system or on any of the band’s gear, but the battery powered LED lights that had been rented for the series were not going to be able to compete with the evening sun as it set. No sparks, smoke or buzzes … or blinking yellow lights. I don’t think anyone noticed … though someone may have wondered what the huge sigh of relief coming from back stage was for! 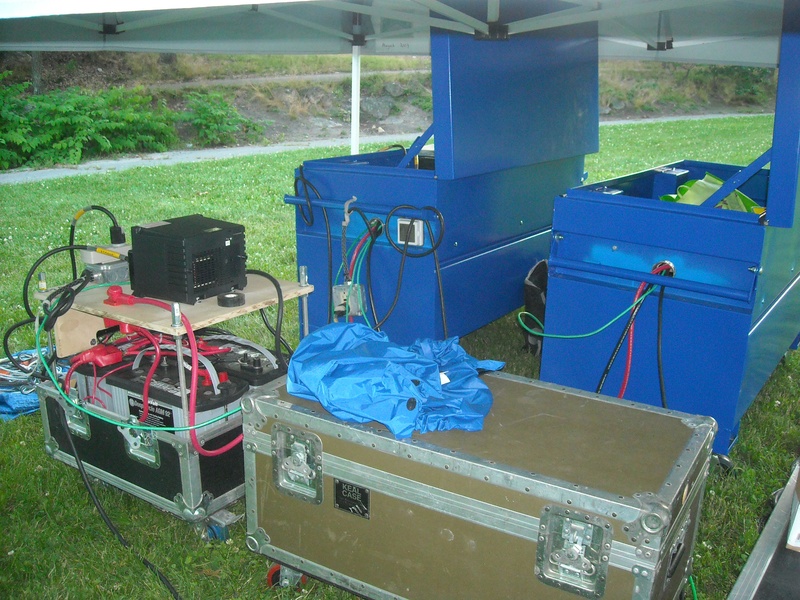 The two battery / inverter systems used to power the 2012 Elma Lewis Playhouse in the Park concert series. The smaller system was recharged each week using two 120 watt solar panels. The concert ended as scheduled … 3 hours and forty five minutes after we had turned everything on for sound check … Using a total of 3.49 kWh of power between the two systems …. Most of that coming from the smaller system powering the PA.
My assumptions about how much power would be needed for the PA and the stage were way off base … But nothing that could not be fixed by just swapping power sources and loads … The morning’s buzz had me a little more concerned … It looked like I would be visiting the electronic supply store again in the morning! 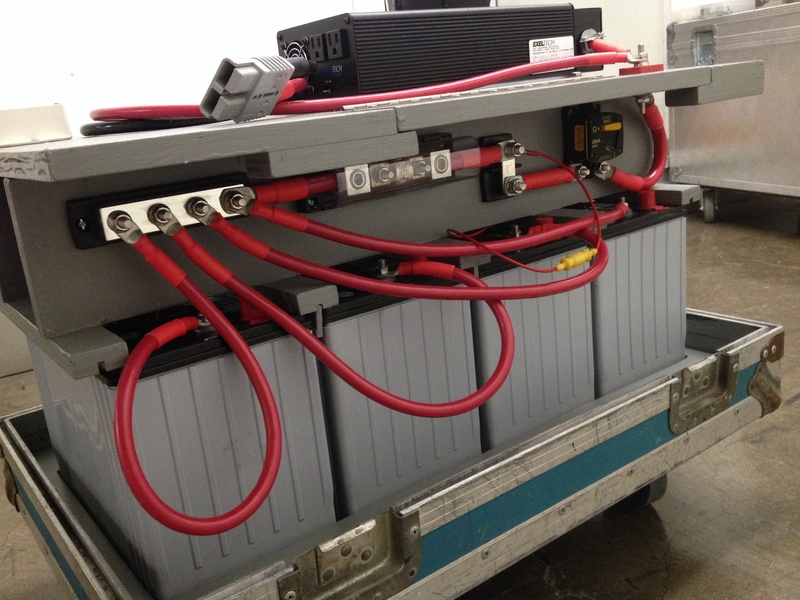 This entry was posted in Outdoor concerts, Solar power, sound system, Uncategorized and tagged 12 volt batteries, Elma Lewis Playhouse, Franklin Park, inverters, Portable solar power on August 7, 2014 by zekibeejr.